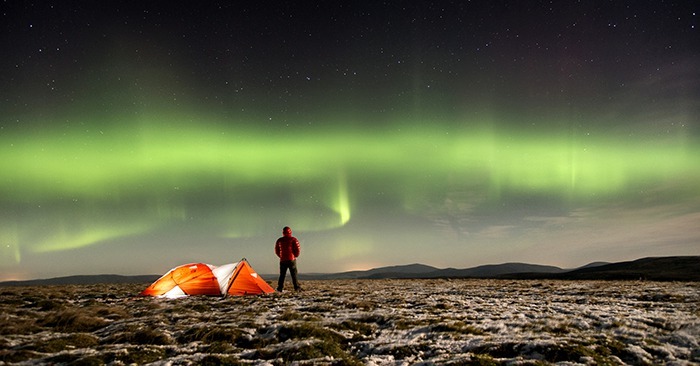 “Shooting The Stars” – observing the aurora from Cairngorms National Park. Photo by Myrddin Irwin. The high quality of the night skies above Tomintoul and Glenlivet have received a prestigious award by becoming Scotland’s second International Dark Sky Park. Awarded Gold Tier status by the International Dark-Sky Association, the Tomintoul and Glenlivet – Cairngorms Dark Sky Park is not only the darkest Dark Sky Park in the UK, it is also the most northern Dark Sky Park in the world. The award is the culmination of several years’ work by the volunteer-led Dark Skies Project to reduce light pollution and preserve the natural darkness of the night skies within The Glenlivet Estate and the Cairngorms National Park. Supported by the National Lottery funded Tomintoul & Glenlivet Landscape Partnership, the project has worked closely with distilleries, farms, Moray District Council and households to change outdoor lighting and reduce light pollution. This will bring many benefits to wildlife, energy consumption, and human health as well as preserving the beauty of the night sky. The designation will also help to promote dark skies to a wider audience and, as experienced in other International Dark Sky Parks, bring astro-tourism business to this remote rural area during the off peak season when star gazing is at its best. The local community celebrated their new Dark Sky Park status at a launch event in Tomintoul on Thursday, 29th November, welcoming amongst others, Professor John Brown, Astronomer Royal for Scotland and wildlife filmmaker and presenter Gordon Buchanan to the event. At the launch event, Buchanan said “Our night skies are not a place of darkness but are in fact a spectacular canvas on which is painted one of the greatest views our planet has to offer. Neither is this view beyond our planet a place of stillness. Professor Brown added “Town-dwelling visitors who visit here will find their blood race when they find the sky to be black and flooded with thousands of brilliant stars rather than yellow/grey and dotted with a few bright smudges. Amateur astronomers will love what wonders the site offers through their telescopes and keen astro-photographers will be able to use extremely long exposure times to get fabulous images of faint cosmic objects. “On top of all this are the general well-being benefits associated with dark skies. Suppression of unnecessary light improves human sleep patterns, saves money, and can actually increase security. It also retains the habitats of diverse nocturnal wildlife such as moths, birds, bats, and even some mammals,” Brown explained. Funding for the project has come from The National Lottery with significant support provided by the Cairngorms National Park Authority and Crown Estate Scotland.